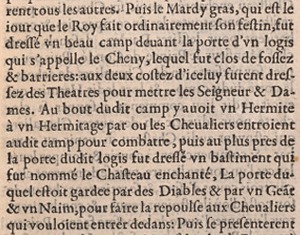 Recueil et discours du voyage du roy Charles IX. de ce nom à, present regnant, : accompagné des choses dignes de memoire faictes en chacun endroit faisant son dit voyage en ses païs & prouinces de Champaigne, Bourgoigne, Daulphiné, Prouence, Languedoc, Gascoigne, Baiõne, & plusieurs autres lieux, suyuant son retour depuis son partement de Paris iusques à son retour audit lieu, és annees M.D.LXIIII. & LXV. Paris : Chez Charles Estienne, Imprimeur du Roy, 1553. On January 24, 1564, the court of the young Charles IX (who had obtained his political majority the previous August) left Paris for Fontainebleau, where the royal entourage prepared for the coming Royal Tour. On March 13, after the celebrations marking the beginning of Lent, the court departed from Fontainebleau and set out on the voyage that would last until May of 1566. This departure followed shortly after the conclusion of the first of the wars of religion and, according to Victor Graham and W. McAllister Johnson’s study, the Queen Mother, Catherine de’Medici, organized the voyage with political aims in mind. After the Treaty of Amboise put an end to the war in March 1563, “[Catherine] wanted to see for herself the situation in the provinces and she hoped that the appearance of the young King would help to reunite discordant elements. She was also anxious to have talks with Phillip II of Spain, that Most Catholic of monarchs, and the ultimate goal of the trip was the city of Bayonne, where it was planned to combine entertainment with diplomatic discussions in a context not unlike that of the Field of the Cloth of Gold where François I and Henry VIII of England had met in 1520” (p. 3). Very little is known about Abel Jouan other than his authorship of the Recueil, but he apparently traveled with the court during the royal tour. Jouan’s preface addressed to the King states that he did not originally intended to publish his journal. Several editions of his account appeared in print shortly after the King’s return. In 1566 and 1567, printers in Paris, Lyon, Toulouse, and Angoulême published the Recueil. The most common of these editions is the first, the 1566 edition printed for Parisian Jean Bonfons. This first edition gives one of the only known documentations of Jouan’s personal biography. Its privilège refers to him as a “Sõmier en nostre cuisine de bouche.” Benoist Rigaud’s 1567 Lyon edition in the Gordon collection is a much rarer version of the text. Jouan’s Recueil records the step by step progression of the royal entourage as it makes its way around the kingdom. Jouan divides his journal into sections of varying lengths. Some sections simply give points of departure and arrival, while others offer greater detail about the events that took place. For instance, Jouan recounts the Fat Tuesday spectacle at Fontainebleau, where several knights attempt to rescue six nymphs held hostage in a haunted castle by a giant, several daemons, and a dwarf. Each section of the text ends by recording the distance in leagues traveled for that entry. On the final page of the journal, Jouan records a total distance of “neuf cens deux lieuës” for the entire trip. In addition to recording the places the court visits and the distance they travel, Jouan also sometimes offers descriptions of local geographic features. Historians have used this to study the political implications of Charles’s tour. Like Charles Estienne’s La Guide des chemins de France, the Recueil offers a glimpse of 16th-century French conceptions of geography. ¹ See the introduction to Victor E. Graham and W. McAllister Johnson’s work for a more detailed account of the tour. Boutier, Jean, Alain Dewerpe, and Daniel Nordam. 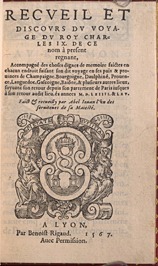 Un tour de France royal: Le voyage de Charles IX (1564-1566). Paris: Aubier, 1984. Graham, Victor E., and W. McAllister Johnson. The Royal Tour of France by Charles IX and Catherine de’Medici: Festivals and Entries. Toronto: University of Toronto Press, 1979. A .pdf of the 1566 edition of the Recueil (A Paris: Pour Iean Bonfons libraire...M.D.LX.VI.) is available from Gallica. Materials on this page were generously contributed by Nicholas Snead, University of Virginia (2008).